We perform Contact Lens Evaluations and Expert Lens Fittings for some of the most challenging and difficult conditions affecting the eye. Conditions including keratoconus, irregular astigmatism, refractive and strabismic amblyopia, and presbyopia can often create suboptimal vision. Dr. Simms is able to use her many years of experience and knowledge of lenses that are available to best suit each individual’s needs. She has a great deal of experience in fitting bifocal and multifocal contact lenses, toric (astigmatism) lenses, hyper-oxygen lenses, rigid gas permeable, scleral and hybrid lens designs. We offer an impressive selection of contact lenses such as; Acuvue, Ultra, Biofinity, Air Optix, Synergeyes, and many more. These lenses come in a number of types including; Daily Disposable (single use), 2 week / 1 month replacement, Contacts for dry eyes, Toric (for astigmatism), Bifocal and Multifocal, Contacts made for irregular astigmatism and corneal degeneration such as Keratoconus, and Multifocal Astigmatic soft and rigid designs. Dr. Simms with her many years of knowledge and experience will ensure that you have the proper fitting and type of contact lenses for your needs. multifocal custom contact lenses from Sheryl on Vimeo. Many people do not fit into standard contact lenses. With custom soft contact lenses, the proper curvature and diameter can be ordered specific to the dimensions of the eye. Custom contact lenses are now available to correct astigmatism including high prescriptions. Multifocal or bifocal prescriptions are also customized to fit each individual’s pupillary size. When a prescription is required for both distance and near vision, there are a few options in contact lenses. Distance contacts with reading glasses are an option, but not most convenient. Another option is monovision, one contact lens for distance and the other for near. Many people can adapt to monovision, but the best comfort and quality of vision is obtained when both eyes work together for distance and near. Multifocal contact lenses are designed as a concentric ring pattern for simultaneous vision. 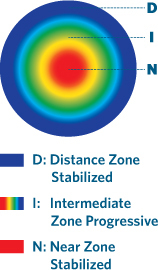 Most lenses have a near zone in the middle and distance rings on the outside. If contact lenses are designed like glasses, the distance and near correction rotates out of place. Due to our pupil changing in size as we look far away versus near, the lenses are designed so we don’t have to think about how to position our head. It naturally happens due the pupillary change. Our pupil sizes vary so the vision may vary depending on how the lens positions on the eye. If not centered well, the lens won’t allow optimal vision. The central optical zone size in custom contact lenses are manufactured to each individual’s parameters. Custom contacts can be prescribed as a more accurate fit can be obtained. The base curve, diameter, and even the concentric ring pattern is designed specifically for each individual. If astigmatism is in the prescription, it can be included in this custom multifocal lens as well. Corneal topography is specialized equipment to take accurate measurements for custom contact lenses and as well as checking the health of the surface of the eye. The initial pair of custom contacts are designed to begin the fitting process. Modifications can be made prior to purchasing the final prescription. Custom multifocal contact lenses are frequent replacement disposable monthly or quarterly. The success rate of quality vision and comfort is very high so it an excellent option in contact lens wear. Scleral Contact lenses from Sheryl on Vimeo. The cornea is the clear tissue on the outermost surface of the eye covering the iris (colored tissue) and pupil. The main function of the cornea is to refract light entering the eye. A normal cornea will have a smooth shape. A cornea with an ectasia will have an irregular shape or bulge. This irregular corneal shape does not refract light correctly and will create irregular and distorted vision. Ectasias can be caused by corneal problems such as keratoconus, or may result after injury to the eye. Keratoconus is the most common ectasia. The cause of the condition is not clearly known. It is a condition in which the cornea thins and bulges into a cone shape causing distorted vision. According to the Global Keratonoconus Foundation, the condition occurs in 50 to 230 patients per 100,000 and in men and women of all races. Scleral lenses can be an excellent choice for a patient with keratonconus or with corneal ectasia. Scleral lenses are designed specifically to vault over the irregular corneal shape and fit on the sclera (white tissue) of the eye while never touching the cornea. 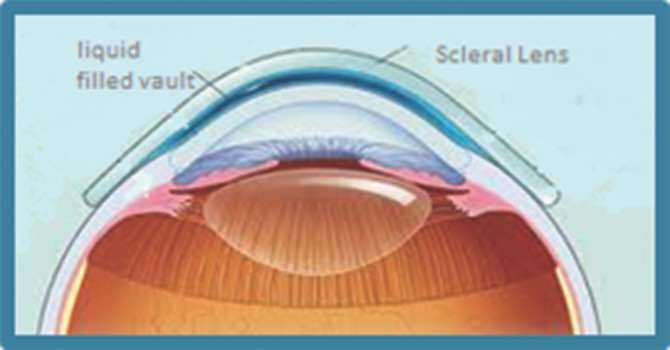 The scleral contact lens creates a new regular surface on the front of the eye that refracts the light correctly. The result is clear, distortion-free vision! The Scleral lens is designed specifically for irregular corneas or those with keratoconus. The lens is made of materials that let oxygen pass through the lens and the design creates a thin vault making it very comfortable and healthy. My Scleral lenses are much more comfortable. They fit perfectly and feel fantastic. Also, they improved the dryness compared to previous contacts. Yes of course I recommend Scleral Lenses! Everything is much better, my sight, my comfort, and the way the lenses feel!!! Thank you for taking the time to fit me perfectly! I have recently completed my first year wearing scleral multifocal contact lenses. Both my vision quality and comfort are improved over standard rigid gas permeable lenses that I have worn for over 40 years. These lenses do not move with each blink, so I forget I am wearing contacts. I have had mono-vision lenses, one eye reading and one eye distance for many years and got to the point that I needed a second pair of glasses to correct my reading eye to distance for driving. I no longer need the second pair of glasses. Very happy with these lenses! My eyes are more moist and comfortable. My vision is exceptionally clear! They are more comfortable than soft contacts. Yes, I think others would be well advised to give scleral lenses a try.